Come and visit Dambulla, a small town in Sri Lanka’s Cultural Triangle, and the impressive “Dambulla Cave Temple” – the main highlight that makes the city a must-see destination! The 150 statues of Buddhas and a few other structures of kings and gods are the leading highlights of the place that support the 5 sanctuary rooms inside the rocks. Also, you will know the history of Buddhism and how the caves were formed and discover that one of them is not as old as the others. Come with us in more adventure and Dambulla, and its archaeological mysteries await you with much history and spirituality. Where is Dambulla – Sri Lanka? How to move around in Dambulla? 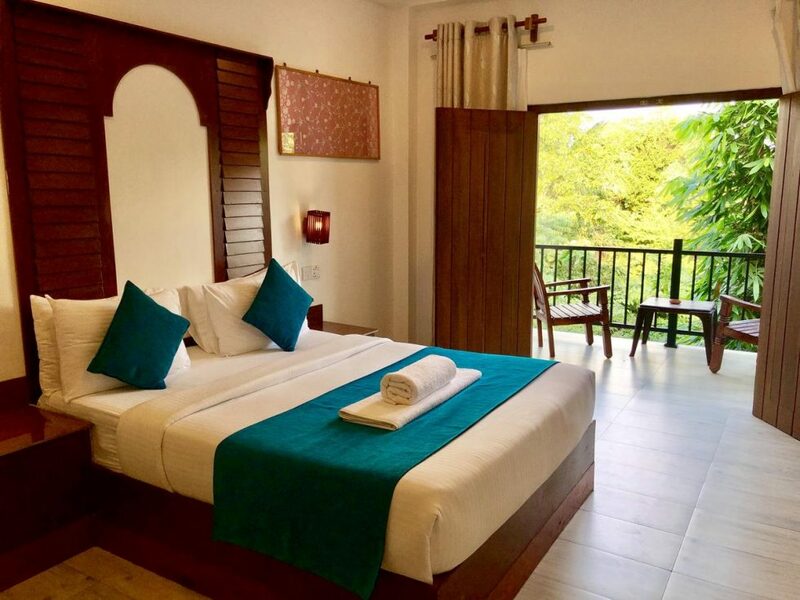 Is it worth staying overnight in Dambulla? Dambulla is a city that is located in the Cultural Triangle of the country near other important monuments like Sigiriya. Continue reading below that we suggest tips to create an exciting itinerary. It is at a distance of about 148 km from Colombo and 72 km from Kandy. According to the local census, the local population is about 75 thousand inhabitants between urban and rural. 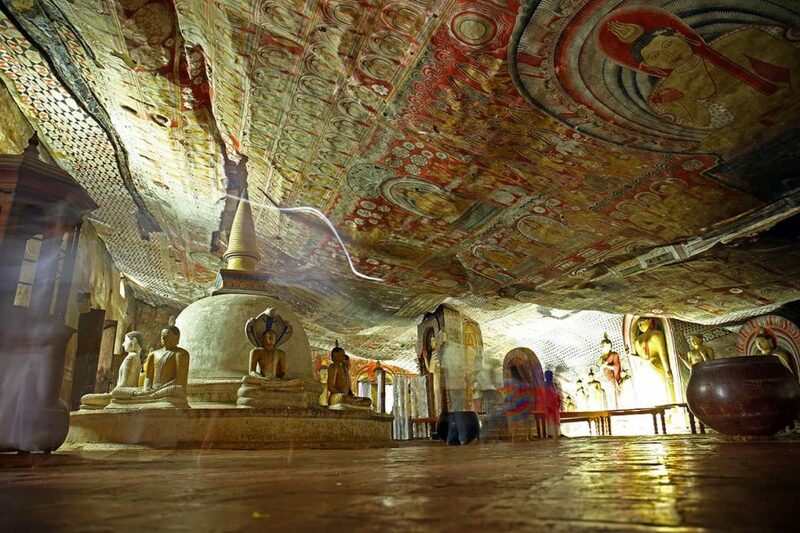 As said, it is in Dambulla that you will find one an essential Buddhist symbol in Sri Lanka – the Dambulla Cave Temple. Dambulla has more to offer than just feeling the cave’s environment: you can relax with the breathtaking views high in the mountains. Take care, and it follows the tradition of covering the shoulders, the legs, and no shorts. Give more details of what you will see inside the massive rocks. Undoubtedly the main attraction of the city is the Dambulla Cave Temple, a sanctuary built on a vast rock pierced with 5 caves. It has been declared a World Heritage Site and is considered the most abundant and most conserved caves complex in the country. As you look at this spectacular work, you will be ecstatic about the human capacity to build something so grand, fitting it perfectly into nature. It is off the main road of Matale and is located at 100 meters of altitude and about 4 km from the city. No need to despair that the walk to get to the place is quiet and without much hindrance. 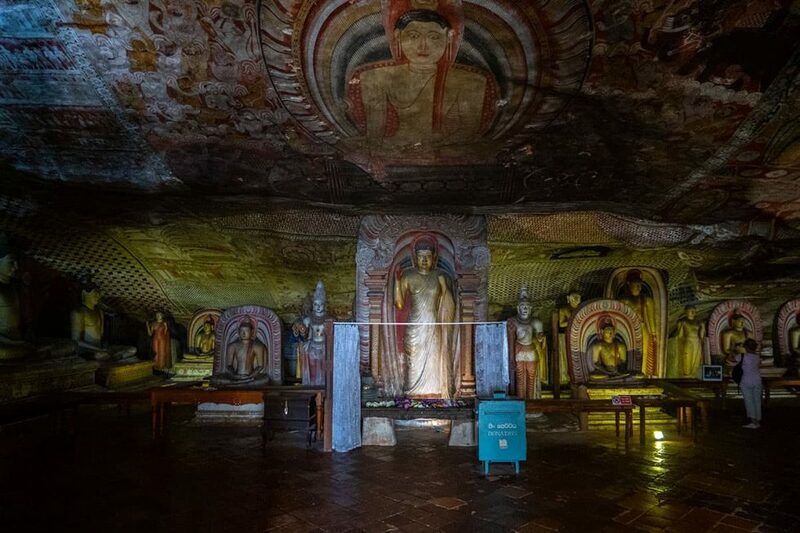 You will see a total of 5 caves, each of which features 150 vivid Buddha statues, kings, other gods and a myriad of paintings and artistic representations of the time. Just as you step into the environment, you will see the first cave, the Temple of the King of the Gods with many stories depicted in the paintings about Buddha’s life. To prove that human capacity really is superior to all limitations and no matter the resources available or the time, a heart that reverence and believe in its divinity suffices. When looking at this place, you will be amazed by the perforations of 7 meters of the rock. Also, you’ll see the 15-meter statues of Buddha and his faithful disciple Ananda and another more hidden than Vishnu’s. The latter is kept in the little sanctuary within that cave, and no one can see it. Then you will be directed to the most incredible golden cave called the Temple of the Great King. It is full of Buddhist gods and some of Hinduism. At the entrance, you will see on the left a wooden statue of Valagamba and inside of Nissanka Malla. 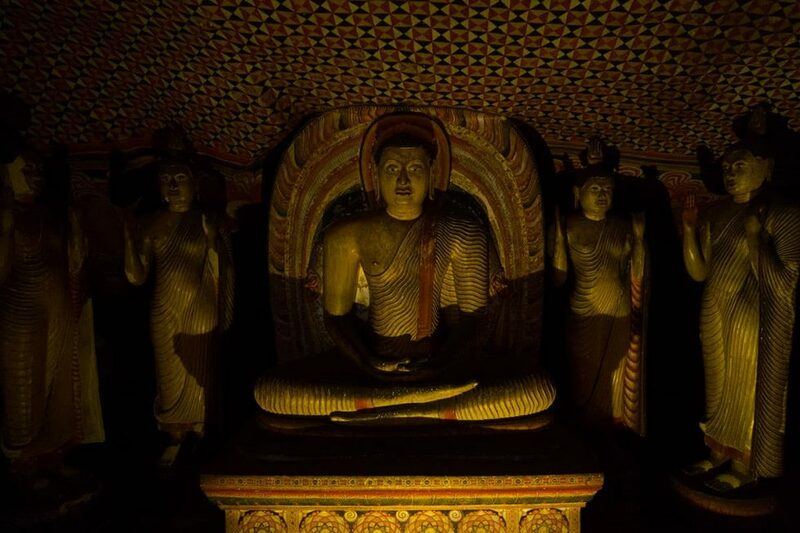 Also, the cave also houses the central statue of Buddha that shines as if it had been covered with pure gold. This relic is surrounded by dragons (protect from negative energies) and with the right hand raised in a position of reverence. Another interesting point is that they use water that always flows down the temple ceiling for the sacred rituals. Then there is this third cave called the New Great Temple. It is separated from the second cave by the masonry wall. This place impresses with secular history. According to reports, in the last reign of the Kandyanos, it would have been used as a pantry. True or not. The cave is exciting and surrounded by various Buddha sculptures. The last but one cave was already considered as Western Cave but lost the post to the previous cave (soon we will talk about it). The location of the Buddha is a major sculpture in Buddha is in a meditative position with the hands tuned in a shell formation. This last cave is the most recent. In the past it was a warehouse. It is also surrounded by Hindu gods like Kataragama and Vishnu, as well as Buddha, of course. Just as the Dambulla caves were built on top of the mountains, only a few meters away you will see another natural richness and mysteries: the archaeological site of Sigiriya. 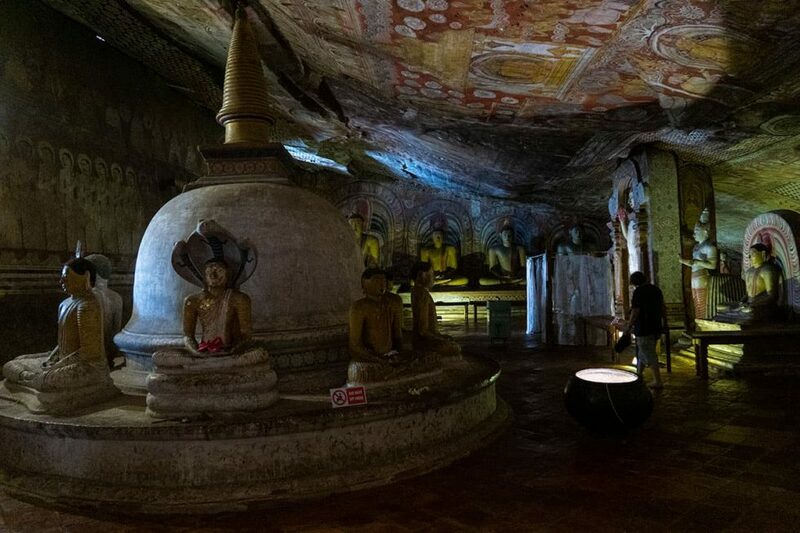 While in the Dambulla cave, look at a breathtaking view and for a few moments stand motionless before the deep and rich natural landscapes of the place. Flying a hot air balloon is an experience that you need to encounter in your passage through Dambulla (depends on the season) preferably early. Imagine yourself on the heights and lose your earthly vision as you contemplate the contrast of mountain riches, monuments, and shining lakes. At that moment he feels closer to heaven and to the soft rays of sunlight that leave in the morning. However, it is only possible to experience this experience between November and the beginning of May. For at this time, the climate is more stable and predictable. The best thing is to go in the first hours of the day. Continue reading the front you will understand about Dambulla’s climate. Upon arriving at Dambulla, you have the option of taking a bus – more time consuming and the other one that is asking for a tuk-tuk – more recommended. Even because if you are tuk-tuk you can visit everything in one day and you already go to another city like Sigiriya. To do this, just head to the center of Dambulla and there take a tuk-tuk to negotiate the passage to the temple of Dambulla and continue to Sigiriya. Take advantage also and reserve your safari in the Kaudulla National Park or Minneriya. By negotiating prices well, your trip will be faster and more economical for this region – as there are plenty of other incredible cities in Sri Lanka. 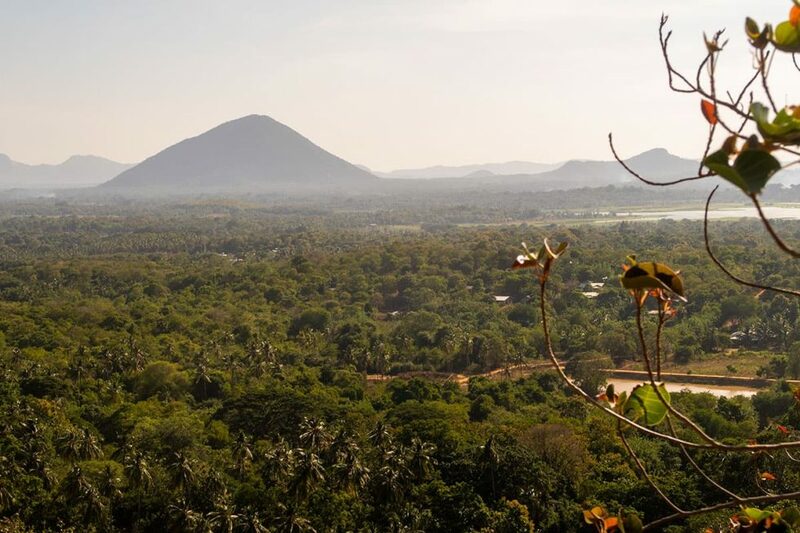 To get to Dambulla depends on your travel itinerary and what to do next. In case you are coming from Kandy or Colombo: go to the bus station of any of the cities – which always leave at regular times to Dambulla. As Dambulla is in a hot zone, it is best to go on a bus with air conditioning or a minivan. The trip lasts a maximum of 2 hours either leaving from Kandy or Colombo. We have a full article on transportation in Sri Lanka in which you will have precious information on how to move from one city to another and trading tips with the Sinhalese. As you know, Dambulla is a city without many attractions, so it is ideal for staying one day and going away at night. Now, if you want to have the experience of flying in the hot air balloon, you’ll have to stay for two days. The Sundaras Resort and Spa is a very comfortable and complete complex in every way. 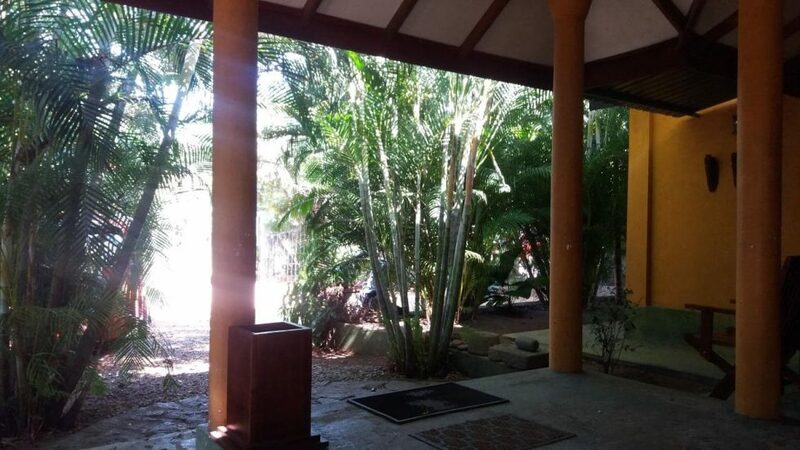 It is located 10 minutes from the cave is an excellent place to rest in Dambulla. Choose the pool or garden view from your room. Also, travelers can choose suites, non-smoking rooms and upgrade with extra services like the spa. Are you going to spend a night here choosing the economic and nice Nature Tourist Inn? He is very close to the cave, so he compensates even more for practicality. The hotel offers rooms with options for air conditioning, wireless internet, and laundry services. It also has private bathrooms. 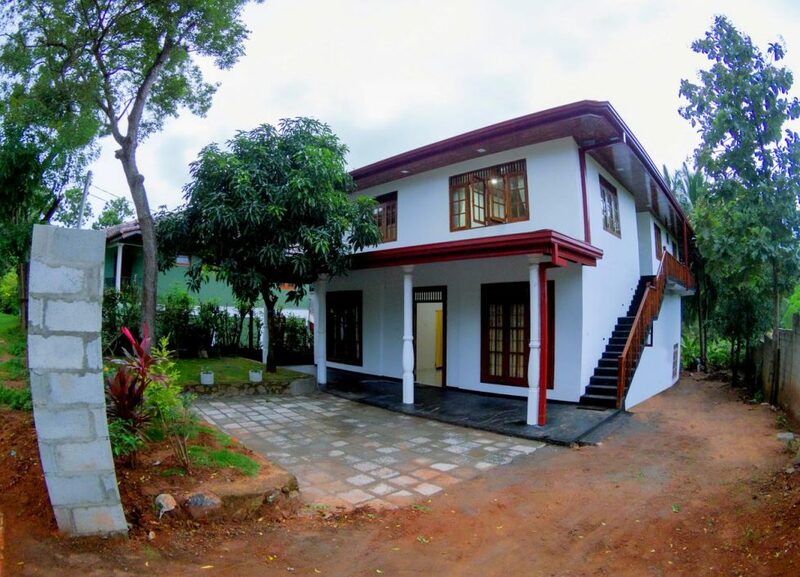 Rock View Home Stay is a hotel located on the Pirivena road just a few kilometers from the center of Dambulla. The accommodation has rooms, bathtubs, a living room and a garden to relax and enjoy the scenery. They offer in-room breakfast services and wifi by courtesy of the house. 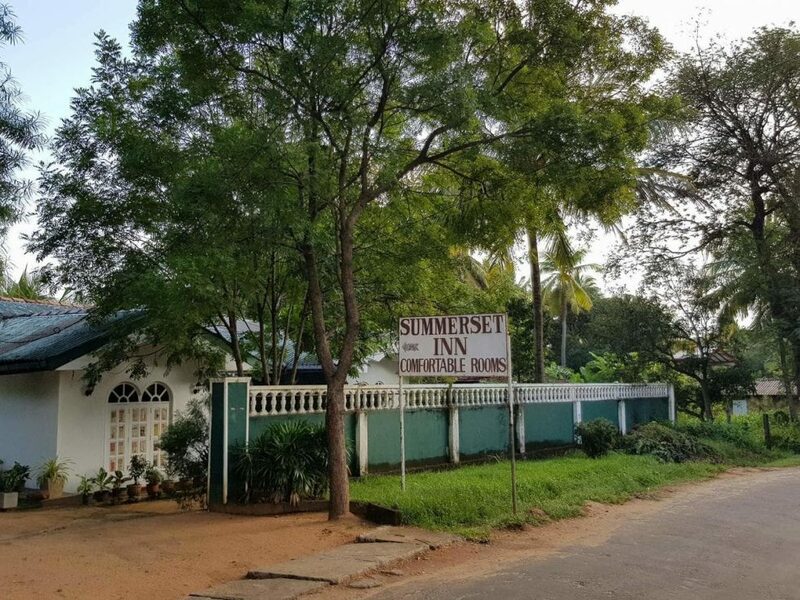 Make yourself at home with the modest, family-friendly Summerset Hostel. The recommendations are that the hotel is intended for non-smoking travelers. Make yourself comfortable at the dining table and choose the best from the menu. The climate of Dambulla is predominantly hot for much of the year, so expect temperatures from 21ºC to 38ºC. Both winter and summer bring warm temperatures, totally the opposite of other regions of Sri Lanka like Hortons Plains. There are two eras to stroll and visit Dambulla: between the end of August until the middle of September and the end of December until the beginning of March. Be aware of other times of the year because this area is hit by devastating monsoons that can disrupt your ride in Dambulla. By the way, check out our article and the tips about the best time to visit Sri Lanka. As Dambulla is limited, then the maximum you stay in the city is one day. Even because in one to two hours is enough to visit the cave. As we have seen, each cave has its history, its symbols, its religious and cultural meanings. Even though the attractions are limited be sure to go and get to know the artistic wealth of Dambulla. Did you like the Dambulla article in Sri Lanka? Know the other suggestions of cities to travel in Sri Lanka. Vem conhecer Dambulla, uma pequena cidade no Triângulo Cultural do Sri Lanka, e a impressionante “Dambulla Cave Temple” — principal destaque que torna a cidade um destino imperdível! As 150 estátuas de Buddhas e mais algumas outras estruturas de reis e deuses são as principais celebridades do lugar que sustentam as 5 salas de santuário no interior das rochas. Além disso, conhecerás a história do budismo e como as cavernas foram formadas e descobrir que uma delas não tão antiga como as outras. Vem connosco em mais aventura e Dambulla e seus mistérios arqueológicos o esperam com muita história e espiritualidade. Onde fica Dambulla Sri Lanka? Como te deslocares em Dambulla? Vale a pena ficar uma noite em Dambulla? Dambulla é uma cidade que fica localizada no Triângulo Cultural do país perto de outros monumentos importantes como Sigirya. Continue a leitura que mais abaixo sugerimos dicas para criares um roteiro bem interessante. Ela fica a uma distância de cerca de 148 km de Colombo e de 72 km de Kandy. Segundo o censo local, a população local é cerca de 75 mil habitantes entre urbanos e rurais. 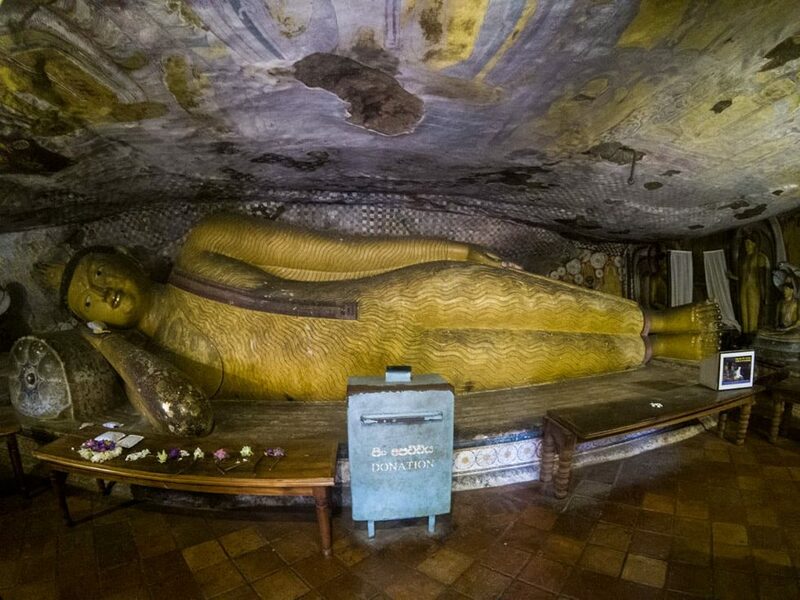 Como dito, é em Dambulla que encontrará um dos mais importantes símbolos budistas no Sri Lanka — a Dambulla Cave Temple. Dambulla tem mais para oferecer do que apenas sentir o ambiente das cavernas: pode relaxar com as vistas deslumbrantes no alto das montanhas. Toma cuidado e segue a tradição de cobrir os ombros, as pernas e nada de shorts. Confere mais detalhes do que verás no interior das rochas gigantescas. Sem dúvida a principal atracção da cidade é o Dambulla Cave Temple, um santuário construído numa enorme rocha perfurada com 5 cavernas. Ele já foi declarado como Patrimônio da Humanidade sendo considerado o maior e mais conservado complexo de cavernas do país. Ao olhar esta obra espetacular entrará em êxtase sobre a capacidade humana de construir algo tão grandioso encaixando-o perfeitamente na natureza. Ele fica fora da estrada principal de Matale e fica localizado a 100 metros de altitude e cerca de 4 km da cidade. Não precisas se desesperar que a caminhada para chegar ao lugar é tranquila e sem muito empecilhos. No entanto, antes de ir passa na bilheteria e por 1500 rúpias compras o teu bilhete. Depois é só entregar o bilhete na portaria e começar a subir os degraus. Ao chegar lá poderás tirar fotos do local, mas em hipótese alguma das pessoas. Respeita! Verás um total de 5 cavernas, em que cada uma delas conta com 150 estátuas vívidas de Buddha, reis, outros deuses e uma infinidade de pinturas e representações artísticas da época. Logo ao pisar no ambiente verás a primeira caverna, o Templo do Rei dos Deuses com muitas histórias retratadas nas pinturas sobre a vida de Buddha. Comprovar que realmente a capacidade humana é superior a todas as limitações e não importa os recursos disponíveis e nem a época, basta um coração que reverencia e crer na sua divindade. Ao olhar esse lugar ficarás admirado com as perfurações de 7 metros da rocha. Além disso, verás as estátuas de 15 metros de Buddha e seu discípulo fiel Ananda e outra mais escondida o de Vishnu. Essa última é mantida no pequeno santuário no interior dessa caverna e ninguém pode vê-la. Em seguida serás direcionado a mais incrível caverna dourada chamada de o Templo do Grande Rei. Ela é repleta de deuses budistas e alguns do hinduísmo. Logo na entrada você contemplará à esquerda uma estátua de madeira de Valagamba e no interior de Nissanka Malla. Além disso, a caverna também abriga a principal estátua de Buddha que brilha como se tivesse sido coberta por ouro puríssimo. Essa relíquia fica cercada por dragões (protegem das energias negativas) e com a mão direita levantada em posição de reverência. Outro ponto interessante, é que eles utilizam uma água que sempre escorre pelo tecto do templo para os rituais sagrados. Depois tem esta terceira caverna chamada de Novo Grande Templo. Ela fica separada da segunda caverna pela parede de alvenaria. Esse lugar impressiona pela história secular. Segundo relatos, no último reinado dos kandyanos, ela teria sido utilizada como despensa. Verdade ou não. A caverna é interessante e cercada por várias esculturas de Buddha. A penúltima caverna já foi considerada como Caverna Ocidental, mas perdeu o posto para a última caverna (logo falaremos sobre ela). Nesse lugar ela possui uma escultura principal em que Buddha está em posição de meditação com as mãos sintonizadas em concha. Esta última caverna é a mais recente, no passado foi um armazém. Ela também é cercada por deuses hinduístas como Kataragama e Vishnu, além de Buddha, é claro. Assim como as cavernas de Dambulla foram construídas no topo das montanhas, a poucos metros você contemplará outra riqueza natural e cheia de mistérios: o local arqueológico de Sigirya. Enquanto estiver na caverna de Dambulla, mira uma vista deslumbrante e por alguns momentos fique imóvel diante das profundas e riquíssimas paisagens naturais do lugar. Voar de balão de ar quente é uma experiência que precisas vivenciar na tua passagem por Dambulla (depende da época) de preferência bem cedinho. Imagina-te nas alturas e perder a sua visão terrena ao contemplar o contraste das riquezas das montanhas, monumentos e lagos brilhantes. Nesse momento sente-se mais próximo do céu e dos tímidos raios solares que saem pela manhã. No entanto, só é possível viver essa experiência entre os meses de novembro e até o começo de maio. Pois nesta época, o clima é mais estável e previsível. O ideal é ir nos primeiros horários do dia. Continue a leitura que a frente entenderás sobre o clima de Dambulla. Ao chegar a Dambulla tem a opção de pegar um autocarro – mais demorado e a outra que é pedir um tuk tuk – mais recomendável. Até porque se fores de tuk tuk consegues visitar tudo em um dia e já segues para outra cidade como Sigirya. Para isso, basta dirigires-te ao centro de Dambulla e lá apanhar um tuk tuk para negociar a passagem para o templo de Dambulla e seguir para Sigirya. Aproveita também e reserve o teu safárie no Parque Nacional de Kaudulla ou Minneriya. Ao negociar bem os preços, a tua viagem vai ser mais rápida e económica por essa região – já que não faltam outras cidades incríveis no Sri Lanka. Para ir até Dambulla depende do teu roteiro de viagem e quais os próximos destinos. Caso estejas a vir de Kandy ou Colombo: dirige-te para a estação de autocarro de qualquer uma das cidades – que sempre saem em horários regulares para Dambulla. Como Dambulla fica em uma zona quente, o melhor é ir num autocarro com ar condicionado ou numa mini van. A viagem dura o máximo 2 horas tanto saindo de Kandy ou Colombo. Temos um artigo completo sobre transporte no Sri Lanka no qual terás informações preciosas sobre como te deslocares de uma cidade para outra e dicas de negociação com os cingaleses. Como sabes Dambulla é uma cidade sem muitas atrações, então o ideal é ficar um dia e ir embora a noite. Agora, caso queiras ter a experiência de voar no balão de ar quente, terás de ficar dois dias. O Sundaras Resort e Spa é um complexo muito confortável e completo em todos os sentidos. Ele fica localizado a 10 minutos da gruta é um bom lugar para descansares em Dambulla. Escolha a vista para a piscina ou para o jardim desde o teu quarto. Além disso, os viajantes podem escolher suítes, quartos para não fumadores e incrementar com serviços extras como o spa. Já que vais passar uma noite que tal escolher o simples e económico Nature Tourist Inn? Ele fica bem pertinho da caverna então compensa ainda mais pela praticidade. O hotel oferece quartos com opções para ar condicionado, internet sem fio e serviços de lavandaria. Além disso, disponibiliza banheiros privativos. O Rock View Home Stay é um hotel que fica localizado na estrada Pirivena a poucos quilómetros do centro de Dambulla. As acomodações contam com quartos, banheiras, sala de estar e um jardim para relaxares e apreciar a paisagem. Eles oferecem serviços de café da manhã no quarto e acesso wifi por cortesia da casa. Sinta-se em casa com o modesto e familiar albergue Summerset. As recomendações é que o hotel é destinado para viajantes não fumadores. Fica à vontade na mesa de jantar e escolha o melhor do cardápio. O clima de Dambulla é predominantemente quente em boa parte do ano, então espera as temperaturas de 21ºC até 38ºC. Tanto o inverno quanto o verão trazem temperaturas quentes, totalmente o contrário de outras regiões do Sri Lanka como Hortons Plains. 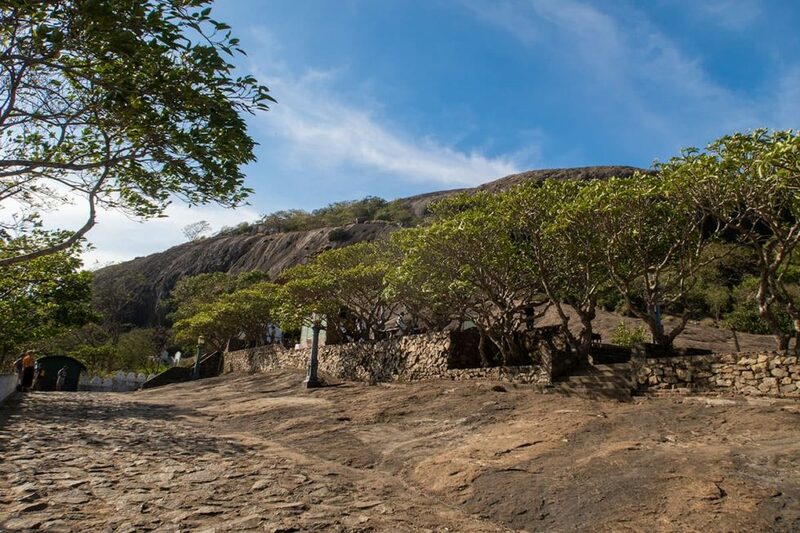 Existem duas épocas para passear e visitar Dambulla: entre o final de agosto até meados de setembro e o final de dezembro até o começo de março. Tenha atenção com as outras épocas do ano porque essa zona é acometida por monções devastadoras que podem atrapalhar o seu passeio em Dambulla. Por falar nisso, confere o nosso artigo e as sugestões de quando ir ao Sri Lanka. Como Dambulla é limitada, então o máximo que permaneces na cidade é de um dia. Até porque em uma a duas horas já consegues visitar a caverna conhecer Dambulla. Como vimos, cada caverna tem a sua história, os símbolos, os seus significados religiosos e culturais. Mesmo que as atrações são limitadas não deixe de ir e conhecer a riqueza artística de Dambulla. Gostaste do artigo de Dambulla no Sri Lanka? Conhece as outras sugestões de cidades para viajar no Sri Lanka. Venha conhecer Dambulla, uma pequena cidade no Triângulo Cultural do Sri Lanka, e a impressionante “Dambulla Cave Temple” — principal destaque que torna a cidade um destino imperdível! As 150 estátuas de Budas e mais algumas outras estruturas de reis e deuses são as principais celebridades do lugar que sustentam as 5 salas de santuário no interior das rochas. Além disso, você conhecerá a história do budismo e como as cavernas foram formadas e descobrir que uma delas não tão antiga como as outras. Venha conosco em mais aventura e Dambulla e seus mistérios arqueológicos o esperam com muita história e espiritualidade. Como se deslocar em Dambulla? Dambulla é uma cidade que fica localizada no Triângulo Cultural do país perto de outros monumentos importantes como Sigirya. Continue a leitura que mais abaixo sugerimos dicas para você criar um roteiro econômico. Ela fica cerca a uma distância de 148 km de Colombo e de 72 km de Kandy. Segundo o censo local, a população local é cerca de 75 mil habitantes entre urbanos e rurais. 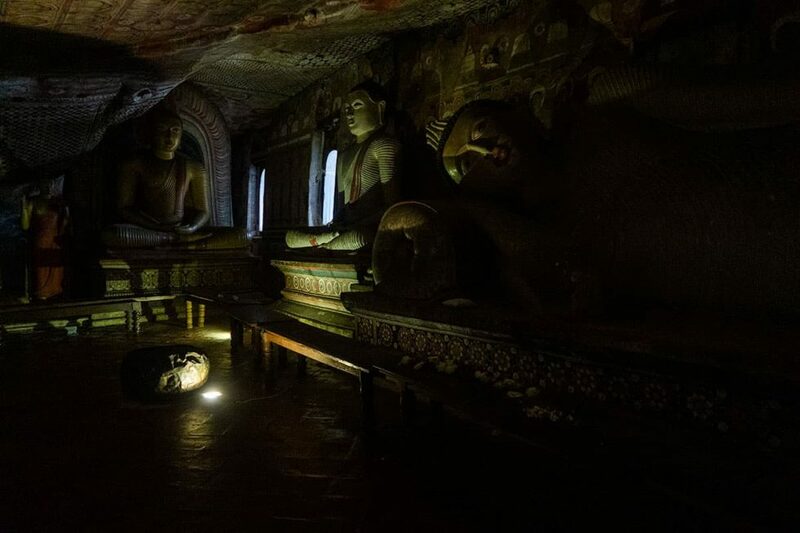 Como dito, é em Dambulla que você encontrará um dos mais importantes símbolos budistas no Sri Lanka — a Dambulla Cave Temple. Tome cuidado e siga a tradição de cobrir os ombros, as pernas e nada de shorts. Confira mais detalhes do que você verá no interior das rochas gigantescas. 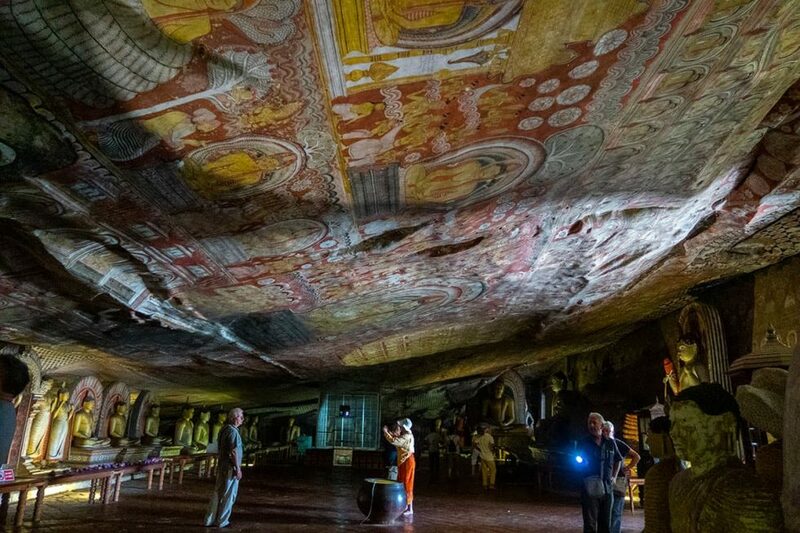 Sem dúvida a principal atração da cidade é o Dambulla Cave Temple, um santuário construído em uma enorme rocha perfurada com 5 cavernas. Ao olhar esta obra espetacular você entrará em êxtase sobre a capacidade humana de construir algo tão grandioso encaixando-o perfeitamente na natureza. Ele fica fora da estrada principal de Matale e fica localizado a 100 metros de altitude e cerca de 4 km da cidade. Não precisa se desesperar que é a caminhada para chegar ao lugar é tranquila e sem muito empecilhos. No entanto, antes de ir passe na bilheteria e por 1500 rúpias você compra o seu bilhete por. Depois é só entregar o bilhete na portaria e começar a subir os degraus. Ao chegar lá você poderá tirar fotos do local, mas em hipótese alguma das pessoas. Respeite! Logo ao pisar no ambiente você verá a primeira caverna, o Templo do Rei dos Deuses com muitas histórias retratadas nas pinturas sobre a vida de Buda. Comprovar que realmente a capacidade humana é superior a todas as limitações e não importa os recursos disponíveis e nem a época, basta um coração que reverencia e crer na sua divindade. Ao olhar esse lugar você ficará admirado com as perfurações de 7 metros da rocha. Além disso, verá as estátuas de 15 metros de Buda e seu discípulo fiel Ananda e outra mais escondida o de Vishnu. Essa última é mantida no pequeno santuário no interior dessa caverna e ninguém pode vê-la. Em seguida você será direcionado a mais incrível caverna dourada chamada de o Templo do Grande Rei. Ela é repleta de deuses budistas e alguns do hinduísmo. Além disso, a caverna também abriga a principal estátua de Buda que brilha como se tivesse sido coberta por ouro puríssimo. Essa relíquia fica cercada por dragões (protegem das energias negativas) e com a mão direita levantada em posição de reverência. Outro ponto interessante, é que eles utilizam uma água que sempre escorre pelo teto do templo para os rituais sagrados. Esse lugar impressiona pela história que nos séculos. Segundo relatos, no último reinado dos kandyanos, ela teria sido utilizada como despensa. Verdade ou não. A caverna é interessante e cercada por várias esculturas de Buda. Nesse lugar ela possui uma escultura principal em que o Buda está em posição de meditação com as mãos sintonizadas em concha. Esta última caverna é a mais recente, no passado foi um armazém. Ela também é cercada por deuses hinduístas como Kataragama e Vishnu, além de Buda, é claro. Voar de balão de ar quente é uma experiência que você precisa vivenciar em sua viagem à Dambulla (depende da época) de preferência bem cedinho. Imagine você nas alturas e perder a sua visão terrena ao contemplar o contraste das riquezas das montanhas, monumentos e lagos brilhantes. Nesse momento você se sente mais próximo do céu e dos tímidos raios solares que saem pela manhã. No entanto, só é possível você viver essa experiência entre os meses de novembro e até o começo de maio. Pois nesta época, o clima é mais estável e previsível. O ideal é você ir nos primeiros horários do dia. Continue a leitura que a frente você entenderá sobre o clima de Dambulla. Ao chegar em Dambulla você tem a opção de pegar um ônibus – mais demorado e a outra que é pedir um tuk tuk – mais recomendável. Até porque se pegar um tuk tuk você consegue visitar tudo em um dia e já segue para outra cidade como Sigirya. Para isso, basta se dirigir ao centro de Dambulla e pegar um tuk tuk para negociar a passagem para o templo de Dambulla e seguir para Sigirya. Aproveita também e reserve a sua parada ao Parque Nacional de Kaudulla ou Minneriya. Ao negociar bem os preços, a sua viagem vai ser mais rápida e econômica por essa região – já que não tem muitas outras cidades incríveis no Sri Lanka. Para ir até Dambulla depende do seu roteiro de viagem e quais os próximos destinos. Caso esteja vindo de Kandy ou Colombo: dirija-se a estação de ônibus de qualquer uma das cidades – que sempre saem em horários regulares para Dambulla. Como ela fica em uma zona quente, o melhor é você pegar um ônibus com ar condicionado. A viagem dura o máximo 2 horas tanto saindo de Kandy ou Colombo. Temos um artigo completo sobre transporte no Sri Lanka no qual você terá informações preciosas sobre como se deslocar de uma cidade para outra e dicas de negociação com os cingaleses. Como você sabe Dambulla é uma cidade sem muitas atrações, então o ideal é você ficar um dia e ir embora a noite. Agora, caso queira ter a experiência de voar no balão de ar quente, será preciso ficar dois dias. O Sundaras Resort e Spa é um complexo muito confortável e completo em todos os sentidos. Ele fica localizado a 10 minutos da gruta é um bom lugar para você descansar em Dambulla. Escolha a vista para a piscina ou para o jardim da sacada do seu quarto. Além disso, os viajantes podem escolher suítes, quartos para não fumantes e incrementar com serviços extras como o spa. Já que vai passar uma noite que tal escolher o simples e econômico Nature Tourist Inn? Ele fica bem pertinho da caverna então compensa ainda mais pela praticidade. O hotel oferece quartos com opções para ar condicionado, internet sem fio e serviços de lavanderia. Além disso, ele disponibiliza banheiros privativos. O Rock View Home Stay é um hotel que fica localizado na estrada Pirivena a poucos quilômetros do centro de Dambulla. As acomodações contam com quartos, banheiros, sala de estar e um jardim para você relaxar e apreciar a paisagem. Eles oferecem serviços de café da manhã no quarto e acesso wifi por cortesia da casa. Sinta-se em casa com o modesto e familiar albergue Summerset. As recomendações é que o hotel é destinado para viajantes não fumantes. Fique à vontade na mesa de jantar e escolha o melhor do cardápio. O clima de Dambulla é predominantemente quente em boa parte do ano, então espere as temperaturas de 21ºC até estourando 38ºC. Tanto o inverno quanto o verão trazem temperaturas quentes, totalmente o contrário de outras regiões do Sri Lanka como Hortons Plains. 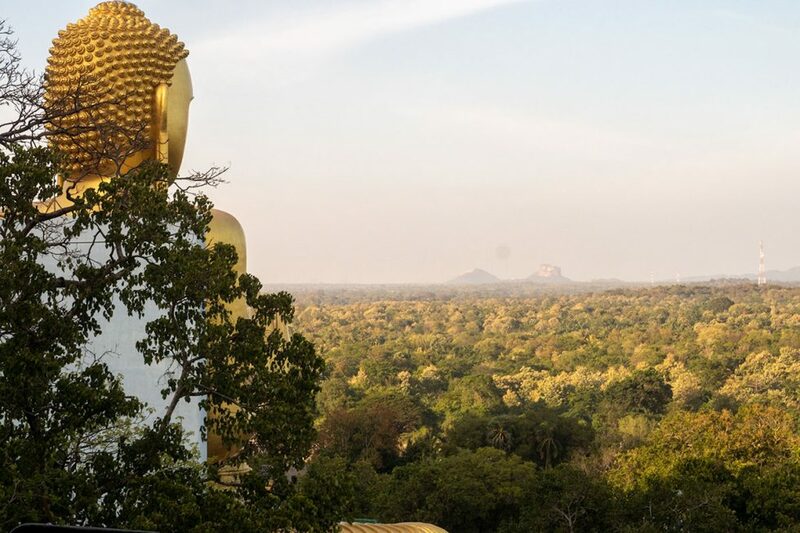 Existem duas épocas para você passear e visitar Dambulla: entre o final de agosto até meados de setembro e o final de dezembro até o começo de março. Tenha atenção com as outras épocas do ano porque essa zona é acometida por monções devastadoras que podem atrapalhar o seu passeio em Dambulla. Por falar nisso, confira o nosso artigo e as sugestões de quando ir ao Sri Lanka. Como Dambulla é limitada, então o máximo que você permaneça na cidade é de um dia. 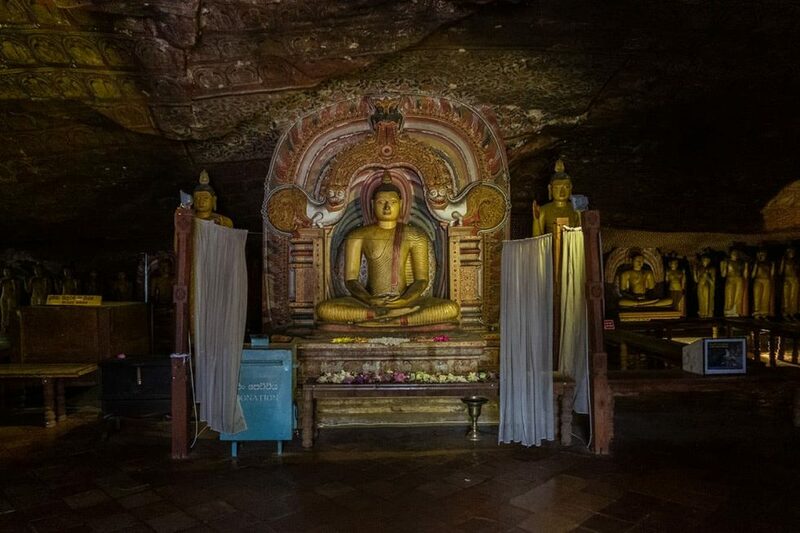 Até porque em uma a duas horas você já consegue visitar a caverna conhecer Dambulla. Como vimos, cada caverna tem a sua história, os símbolos, os seus significados religiosos e culturais. Mesmo que as atrações são limitadas não deixe de ir e conhecer a riqueza artística de Dambulla.Gostou do artigo de Dambulla Sri Lanka? Conheça as outras sugestões de cidades para você viajar no Sri Lanka.